The Romans are not said to have been particularly creative or original when it came to music. They did attach any spiritual ethos to music, as did the Greeks. Yet, if the Romans admired Greek music as much as they admired everything else about Greek culture, it is safe to say that Roman music was mostly monophonic (that is, single melodies with no harmony) and that the melodies were based on an elaborate system of scales (called 'modes'). The rhythm of vocal music may have followed the natural metre of the lyrics. There were also other, non-Greek, influences on Roman culture - from the Etruscans, for example, and, with imperial expansion, from the Middle Eastern and African sections of the empire. Thus there were, no doubt, elements of Roman music that were native Latin as well as non-European; the exact nature of these elements is unclear. An attempt to recreate Roman music reconstructing the instruments has been done recently in Italy by Walter Maioli and his group Synaulia. The tuba - not the modern tuba, but a long and straight bronze trumpet with a detachable, conical mouthpiece like that of the modern French horn. Those found are about 1.3 metres long; they had a cylindrical bore from the mouthpiece to the point where the bell flares abruptly, in a fashion similar to that of the modern straight trumpet often seen in presentations of 'period music', but there were no valves -one instrument was capable only of a single overtone series. It was essential to the military, providing 'bugle calls' and was apparently borrowed from the Etruscans. The cornu - a bronze instrument shaped in an arc covering somewhat more than half a circle (shaped like an upper-case letter 'G') with or without a cross-bar/handle across the diameter. It had a conical bore (like a modern French horn) and a conical mouthpiece. Also used in the military and also borrowed from the Etruscans. 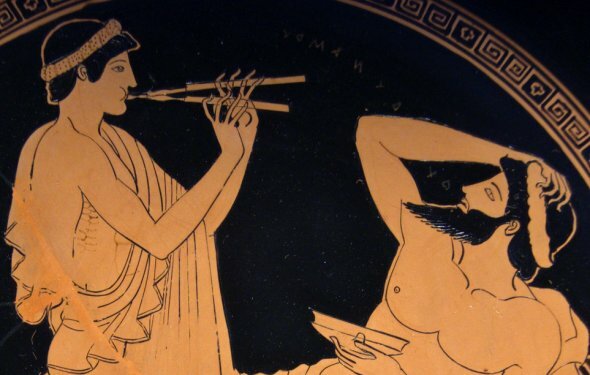 The aulos (the Greek word, Latinized, was tibiae) - usually double, consisting of two double-reed (as in a modern oboe) pipes, not joined but generally played with a mouth-band to hold both pipes steadily between the player's lips. Modern changes indicate that they produced a low, clarinet-like sound. There is some confusion about the exact nature of the instrument; alternate descriptions indicate each pipe having a single reed (like a modern clarinet) instead of a double reed. The askaules - a bagpipe. The cithara was the premier musical instrument of ancient Rome and was played both in popular music and in serious forms of music. Larger and heavier than a lyre, the cithara was a loud, sweet and piercing instrument with precision tuning ability. It was said some players could make it cry. From cithara comes our word guitar and though the guitar more directly evolved from the lute, the same mystique surrounds the guitar idols of today as it did for the virtuoso cithara players, the citharista, and popular singers of ancient Rome. Like other instruments, it came originally from Greece and Greek images portray the most elaborately constructed citharas. It was considered that the gods of music, the Muses and Apollo, gave cithara players their gift to mesmerize listeners. The lyre, borrowed from the Greeks, was essentially an early harp, with a frame of wood or tortoise shell and various numbers of strings stretched from a cross bar to the sounding body. The lyre was held or cradled in one arm and hand and plucked with the other hand. The Romans gradually abandoned this instrument in favor of the more sophisticated cithara, a larger instrument with a box-type frame with strings stretched from the cross-bar at the top to the sounding box at the bottom; it was held upright and played with a plectrum. The strings were tunable by adjusting wooden wedges along the cross-bar. The lute, the true forerunner of the guitar (cithara), is considered a medieval instrument but was played by the ancient Romans. The Roman lute had three strings and was not as popular as the lyre or the cithara, but was easier to play. There are some mosaic images of organs and fragmentary remains in the National Archaeological Museum of Naples. The pipes were sized so as to produce many of the modes (scales) taken over from the Greeks. From the fragments, the instruments seem to be a cross between the bagpipe and the organ. It has not been established if they were blown by the lungs or by some mechanical bellows. Variations of a hinged wooden or metal device (called a scabellum) - a clapper - used to beat time. Also, there were various rattles, bells and tambourines. Drum and percussion instruments like timpani and castanets, the Egyptian sistrum, and brazen pans, served various musical and other purposes in ancient Rome, including backgrounds for rhythmic dance, celebratory rites like those of the Bacchantes, military uses, hunting (to drive out prey) and even for the control of bees in apiaries. Some Roman music was distinguished for its having a steady beat, no doubt through the use of drums and the percussive effects of clapping and stamping. Egyptian musicians often kept time by snapping the fingers. In spite of the purported lack of musical originality on the part of the Romans, they did enjoy music greatly and used it for many activities. Scott recounts the obvious military uses of the tuba for signaling, as well as music for funerals, private gatherings, public performances on the stage and large gladiatorial spectacles. Music was also used in religious ceremonies. The Romans cultivated music as a sign of education. Music contests were quite common and attracted a wide range of competition, including Nero himself, who performed widely as an amateur and once traveled to Greece to compete. There are also numerous references to hundreds of trumpeters and pipers playing together at massive games and festivals - and even of normally hand-held citharas built as large as carriages. The Romans freed their slaves after a period of time. They could then become Roman citizens because any fee man who established permanent residence there could become a citizen. When Rome became a megacity, the majority of citizens were freedmen and descendants of freedmen. The Greeks could not understand that. It was beyond their frame of mind. Roma Surrectum, covering the era from 280BC onwards, is a complete modification for Rome: Total War. It aims to improve both the battle and campaign AI and portray a more realistic view of the ancient world, while remaining an enjoyable and challenging experience. Starting in ancient Greece, places have been described in topography (τοπογραφία), and an author of such writing has been called a topographer (τοπογράφος). Greek and Roman topographers provide much of the basis of modern reconstructions of the fabric of the cities of Classical times, and especially that of Rome.